If you experience frequent back pain or suffer from certain spinal conditions, a back brace can relieve pain and keep you going longer. Though you can get a doctor’s recommendation to purchase a brace, there are many great options that don’t require you to go to the doctor and get a written approval. According to an article on back pain featured on WebMD, 80% of Americans will suffer from a back problem at some point in their lives. Choosing the right brace can be part of a healthy regimen of back support for the elderly. When thinking about purchasing a brace, it’s important to determine which type of brace will help you address pain or any spinal condition you may have. It’s also important that you speak with your doctor to determine when to wear you brace and for how long. To get the most out of your purchase, have a plan that includes using your brace to support a healthy lifestyle. Back braces are designed to reduce muscle tension and help you distribute weight evenly. It is, however, very important to consult your doctor and ensure you are using your brace correctly. Some literature suggests that improper use can cause side effects such as weakening muscles over time. Rigid and Semi-Rigid Orthoses: These heavy braces apply pressure to the torso maintain good posture and transfer weight from the spine to abdomen. These typically have support sections in the front, back, and sometimes sides that provide less flexible support. Semi-rigid orthosis combine these elements with those of more flexible brace options. 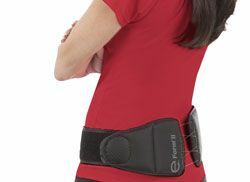 Flexible braces: flexible braces including corsets, lumbar belts, and sacroiliac belts provide moderate support and slightly limit your range of movement. These braces support weakened muscles or joints. Look for a snug but comfortable fit that provides support. Upper back & shoulder braces: these less common braces should typically only be worn when directly advised by your doctor. These braces provide extra support for upper back muscles and help improve posture. 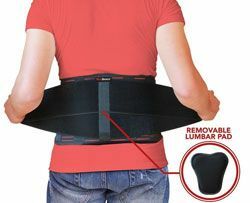 BraceUP – available in 3 sizes, back braces from BraceUP are entirely adjustable to fit you perfectly. This provides maximum support with a flexible brace. One drawback is that they can take a while to get used to. Be sure to watch online tutorials or get assistance from a friend to make sure that you’re properly adjusting the brace to fit your body. AidBrace – This company, which makes braces for a number of different uses, offers a support belt which is highly ranked for comfort and support. It also features a removable lumbar pad which provides extra support when lifting heavy objects or participating in strenuous exercise. Exos – With a range of different braces, Exos probably has a good option for your needs. Their designs are generally adjustable, to get a great fit. Their support belt models are a great option forregular use. DonJoy – This brand offers both back braces and other support accessories like ice packs designed specifically to address backpain. They make a couple elastic models that allow for adjustments to the amount of support they provide. They have a history of great reviews for back support for the elderly. Don’t overuse. Braces are meant to add extra support when doing strenuous activities, and should not generally be worn all day. Achieving optimal back support for the elderly often includes back strengthening exercises in addition to occasional brace use. Speak with your doctor before wearing a brace for long periods of time, as this could encourage muscles to weaken over time. Get the correct size. To make sure you’re getting the support you need, measure accurately and make sure you purchase the correct size. Have someone help measure you if needed, to avoid twisting, sucking in your stomach, or otherwise distorting your measurements. Wear it properly. The belt should sit at or below your belly button, and should not be too tight or too loose. This will maximize your support. Make sure your belt sits evenly across your body, not sagging on one side, the front, or the back. Check-in with your doctor. Make sure to check in with your doctor regularly to make sure you’re seeing the correct results. Poor muscle strength or lack of change in pain levels could be a sign that you’re using your brace improperly. In many cases, medicare covers part or all of a back brace purchase. Speak with a medicare representative to determine whether you’re covered. You can also check with your insurance plan. Even partial coverage can help you get a better brace for your money. If not, be sure to consider your budget before you begin shopping. Braces can range greatly in price, anywhere from $40-$1000. If you’re concerned about overspending, ask your doctor’s office if they have coupons available for any products, or stop by your local drugstore (try CVS or Walgreens) to look at the moderately priced models they carry. If they have a brace that suits your needs, it could save you a bit of money. Wearing a brace isn’t the magic bullet to solving your back pain issues. It’s just one part of a holistic approach that you and your doctor can pursue. There are a number of things you can do to support a healthy back throughout your life. Be sure to consult with your physician to make sure you’re taking good care of your back, especially if you suffer from a spinal condition. For many people with frequent back pain, the following can be a great part of caring for their bodies. Sleep well – be sure you are taking care of yourself when you sleep. Replace your mattress if necessary, and add pillows where necessary to relieve pressure on your spine. Healthline offers a quick guide to sleeping positions for lower back pain. Exercise to train your back muscles – a regiment of exercise made for aging seniors can help those who have frequent back pain. Even regular walks can help loosen muscles and support your back. Practice relaxation – don’t store stress in your back muscles. Take time to unwind each day, and consider joining a group therapy session or try listening to a guided imagery exercise. You may be able to find recorded guides at your library or download a mindfulness app. Caring for your body, especially as you age, requires a full program. A healthy lifestyle will support a strong regimen of caring for your back. Healthy sleep, diet, exercise, and taking time to care for your mental health, all work towards a healthier you, which makes caring for aches and pains easier over time. 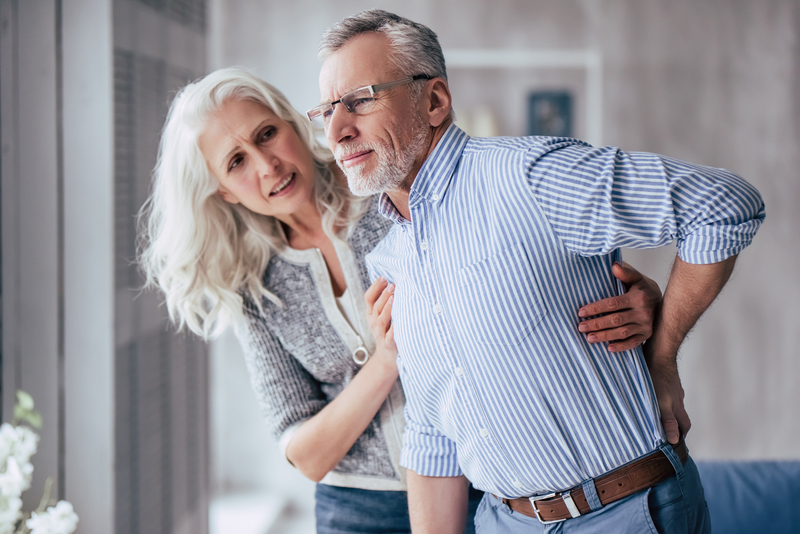 Work with your doctor to create an overall health plan, and ask how using a back brace to manage pain or certain conditions can be part of this plan. 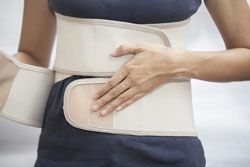 If you experience frequent back pain or suffer from certain spinal conditions, a back brace can relieve pain and keep you going longer. Though you can get a doctor’s recommendation to purchase a brace, there are many great options that don’t require you to go to the doctor and get a written approval. According to an article on back pain featured on WebMD, 80% of Americans will suffer from a back problem at some point in their lives. DonJoy – This brand offers both back braces and other support accessories like ice packs designed specifically to address backpain. They make a couple elastic models that allow for adjustments to the amount of support they provide. Don’t overuse. Braces are meant to add extra support when doing strenuous activities, and should not generally be worn all day. Speak with your doctor before wearing a brace for long periods of time, as this could encourage muscles to weaken over time.